Unlike Windows, Chromebook makes Chrome operating system updates routine easy and quick. Ideally, over a period of time computer slows down. But Chromebook features has impressive listing of auto updating Chrome operating system on Chromebook devices. New updates are installed seamlessly making Chromebook faster than before. Besides the automatic Chrome OS update option, you can also manually check for operating system updates on Chromebook. Please note: While checking for updates, your Chromebook will send information including: version number, language and other update-related details back to Google servers. There is no privacy concern, as sent information is not related to you or your signed in Google account. 1. Chromebook automatically checks for available operating system updates. 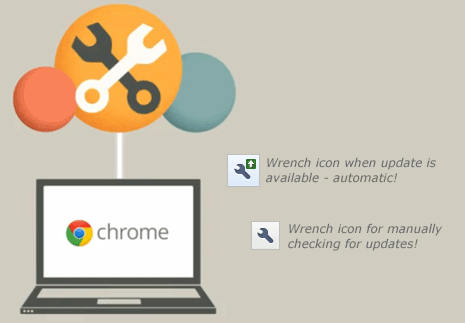 If an update is detected, you should see wrench icon with up arrow on browser toolbar. Click on that icon to proceed. 2. Then select Update Chrome OS. Then a dialog box will appear, click Restart button on it. Chromebook device will restart automatically. 3. Updates will be installed automatically after Chromebook starts back from the restart routine. 1. You can also manually check, if any update for Chrome operating system is available for your Chromebook. Click wrench icon on browser toolbar to get started. 2. Click About Chrome OS option and then click Check for update option. You should get prompt for available update, if it is actually available for your Chromebook. Updating Chromebook is as easy as updating Google Chrome web browser. No need for manual download and install. It updates Chrome operating system automatically in the background.